The first in an all-new library of Valiant classic! Collected for the first time anywhere, the best-sellng title of the 90s is back! Re-presenting the first arc of his original adventures in the VH1 Valiant Universe, Bloodshot comes armed to the teeth with bullets, nanites - and questions. 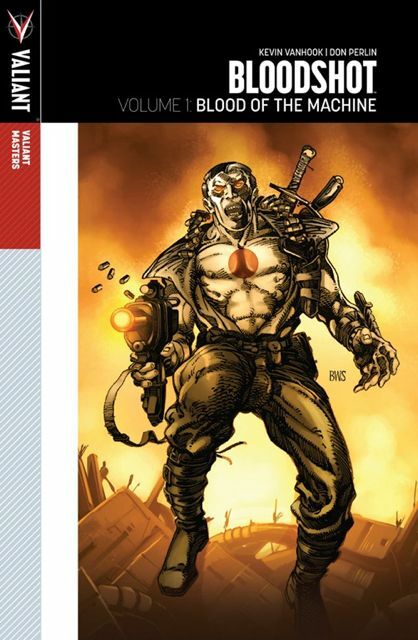 With all of New York as his battlefield, Bloodshot wages a one-mar war for the secrets to his past. But with the whole of New York's mafia underground hot on his tail, he'll soon realize that some questions are better left unanswered! With appearances from Ninjak, Eternal Warrior, Rai and more, no fan can miss this essential piece of Valiant history! Collecting Bloodshot (1994) #1-8 and featuring AN ALL-NEW, NEVER-BEFORE-SEEN STORY by the original creative team of Kevin Van Hook and Don Perlin!